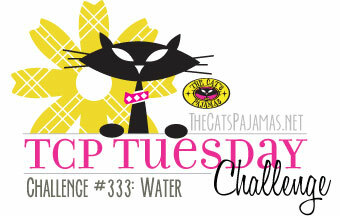 We’re kicking off another two week Challenge at The Cat’s Pajamas, and this time, I threw down the theme of ....Water. There are so many ways you can go with this theme: rain, water, ocean, even watercolour, there are a lot of great possibilities. My little niece just had a her 8th birthday and she saw a card I had created a long time ago with this set and she loved it. So, that’s what I pulled out to create her card. 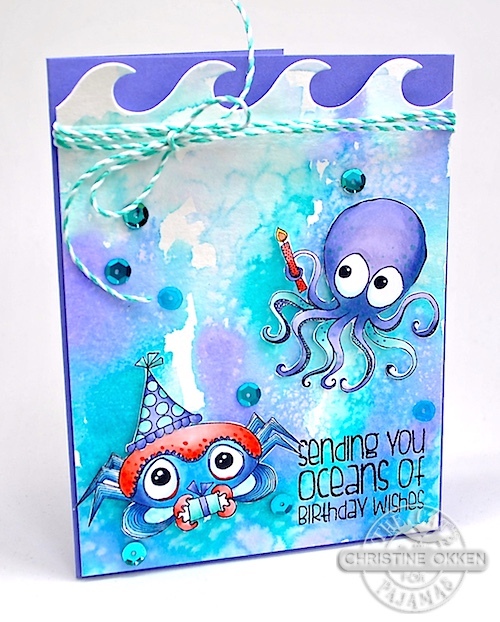 It’s with The Cat’s Pajamas Seas the Birthday set, which is just so cute with these big-eyed ocean creatures. I stamped the crab and octopus onto XPress it Blending Cardstock and then coloured them up with Copics, trimming them out carefully and setting them aside. To create the ocean background I started with some watercolour paper and washed in some turquoise and purple ink, letting it bleed and go where it wanted to. Then as it was still wet I sprinkled some course salt over the paper to get that mottled texture to the page. The salt soaks up some of the colour and leaves behind a cool texture. After it’s all dry, just scrape it all away. To finish off the top of the design I used TCP’s Waves CutUps Border for the top, and then wrapped around some twine and added some sequins as “bubble” accents. Here’s the Copics I used for my party-goers. Come on in and join us with your Water creations. You could win Cat’s Cash to spend at the TCP store! 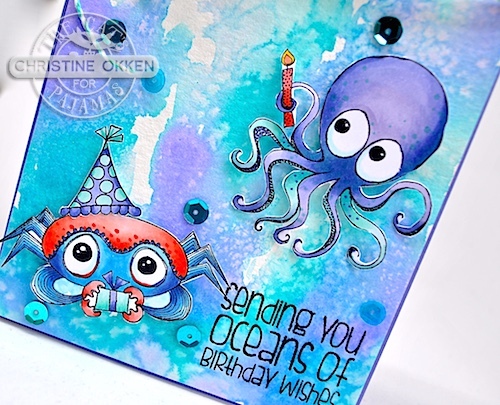 Fabulous card, absolutely love the colours you have used. Amazing colours. I adore everything about this card - especially all that glorious color. I pray that you are feeling better Christine.